A stylish looking guitar that's straight from the 80s, with great rock tones and features to keep shredders happy all day long. Stylish looks. Good rock sound. Heavy-duty moulded case. Not as good as Suhr's Rasmus Standard S100. 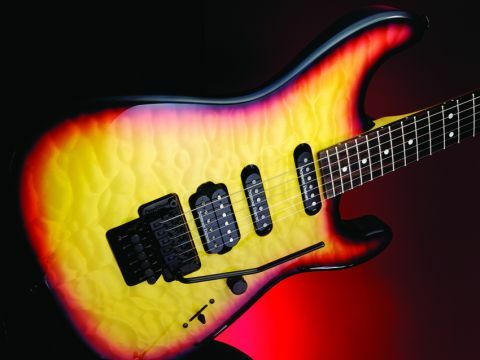 Charvel has its roots in the 80s superstrat boom. The Wild Card's Strat-style headstock. The San Dimas comes with a Molten Lava Crust paintjob. The Charvel Pro Mod San Dimas Wild Card Molten Crust Lava, to call it by its full name, couldn't look any more 80s if it was wearing a 'Frankie Says' t-shirt. Why Wild Card? Well, every three months Charvel builds a Japanese-made Pro Mod guitar with custom tweaks. This time it's an eye-pleasing paint job called Molten Lava Crust. "We all love the way the headstock looks. The guitar-shaped logo is cool too." The guitar's alder body is capped with a slice of maple, while the bolt-on maple neck has a comfortable C profile. The fingerboard employs a compound radius that runs from 12 to 16 inches. This is designed to make playing chords comfortable on the lower frets while allowing excellent string bending above the 12th fret. Charvel has also gained permission to use Fender's trademark headstock. That's not too much of a stretch as it happens; Fender does own Charvel, after all. We love the way the headstock looks. It's more stylish than the pointy 'stocks that were prevalent in the 80s. The guitar-shaped logo is cool too. The Charvel comes with a Seymour Duncan TB-4 Jazz Blues model humbucker (better known as the Jeff Beck) in the bridge position and a pair of STK4 stacked singlecoils, which are designed to reduce hum. You also get a locking Floyd Rose vibrato. It's recessed so you can pull up on the bar for that 'cow being chain-sawed' effect. Push the bar all the way down and the strings lie floppy on the fingerboard, which is just the thing if you want to mimic a motorcycle. Tonally, the Charvel is all about rock. The JB has a proven track record for pumping out a great rock tone. Add overdrive to its singlecoil pickups and you'll get cool Hendrix-like tones. The San Dimas is a well made guitar that has all the goodies any self-respecting shredder could dream of. The Strat headstock definitely adds to the guitar's cool factor and we're impressed with the heavy-duty moulded case that comes with it. If you like to divebomb and make motorbike noises on your guitar, the Wild Card is worth a look. As Bill and Ted, the other famous residents of San Dimas, might say: this guitar is definitely not bogus.